For alphabetical malt whisky drinkers, their quest gets serious upon arrival at the letter G. The aperitif will be Glen Albyn and one can rest with Glen Turret as digestif. In between you will encounter famous valleys - the likes of Fiddich, Farclas and Morangie. These are not the ones I will focus on this time; they usually draw enough attention. No, we will wander the lesser glens of whisky country that gave their names to malts as well as blends. Whoever has been there will immediately acknowledge that. Come rain or shine, hail or storm, snow or ice, that place will leave a special mark in your brain forever. Whenever I cross this valley, and I was fortunate to have been able to do this under practically every thinkable weather circumstance, I see fighting Highlanders in my mind’s eye. This works best when the weather is really bad. Here, in 1692, the Campbells slaughtered the MacDonalds, after having partied with them for a fortnight. It turned out to be a political assassination, but would give the Campbells a bad name that echoes today. The valley itself is named after the eponymous river that runs through it, but was nicknamed ‘Glen of Weeping’ after the 17th century clanocide. 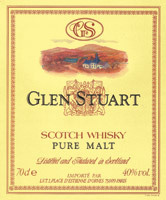 As can be read on the label, this malt was made at Ben Nevis Distillery, further north. Halfway down Loch Ness on the western shore, just south of the village of Drumnadrochit, the ruins of what once were the mighty headquarters of Clan Urquhart jut out into the loch. 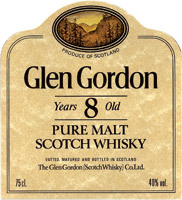 This blend has been composed by Gordon & MacPhail (G&M) from Elgin. 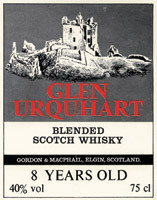 Not surprisingly so, since this well-known independent bottler is owned by the Urquhart family. The castle ruins are a splendid place to take photos from the loch, to the east, the north and south. I once baptised a Dutch lifestyle journalist on his maiden trip to Scotland in Loch Ness at this exact place, helped by two eager assistants no less than Jon Beach of Fiddlers Inn fame and Scottish painter Ian Gray. At the time ‘pure malt’ was favoured as a term for a blend of different malt whiskies, also known as vatted or blended malt. The head of the clan is the Earl of Huntly, whose traditional seat is home to an independent bottler by the name of Duncan Taylor. The latter did not bottle this particular blend, as the label shows. The image is that of Huntly Castle, another ruin worth visiting. If the Stuarts of Bute are meant in this particular case, we can speak of a true historical reason for the naming of the whisky. This branch of the Stuarts is rooted in the Seneschals of Dol in Normandy and first manifested itself in England during the Norman invasion. Centuries later a return journey was made in liquid form to the country of origin. In Campbeltown on the tip of the Kintyre peninsula one can find a distillery with the same name. However, this whisky is not made there. 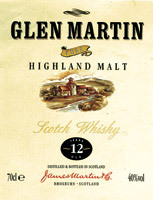 The brand name Glen Gyle is owned by Loch Lomond Distillers, north of Glasgow, whilst Glengyle Distillery belongs to adjacent Springbank. The latter rebuilt Glengyle starting in 2000; it had been closed and all stocks sold in 1925. The stills at Glengyle now produce a single malt called Kilkerran. 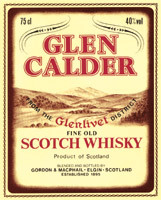 The label of Glen Gyle Highland Malt depicted here was bottled by Fraser MacDonald Distillery, a company currently not active in the whisky industry. Are you still with me? Yes? Then let’s move on to the next one. That happens more often in Scotland. These products are being made at respected single malt distilleries. One of them is Tomintoul, where one can have a malt or blend made to order. This distillery, on the outskirts of the highest village in the Highlands has a huge blending installation on site. Broxburn is near Glasgow, an area with many bottling plants. Remarkably the majority of these vatted malts are aged eight years old. I suspect that older whiskies were reserved for bottling as a single malt. 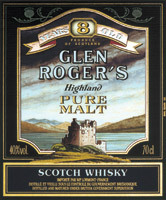 On the Hard to Find Whisky website I traced back a bottle, complete with packaging (see: http://www.htfw.com/other-blended-malts-glen-roger-s-pure-malt-8-year-old) but not for sale anymore. 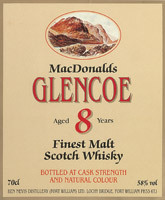 According to the ‘rare whisky site’ it would have been bottled between 1960 and 1970 and is currently worth between £20–£40. The glen itself is loved by hikers and part of a fivesome jointly known as the Angus Glens, bordering the Cairngorms National Park. Helpful websites show walking routes that will take you through the glen in approximately five to six hours. The views are spectacular (and where wouldn’t it be in the Highlands and Islands?). 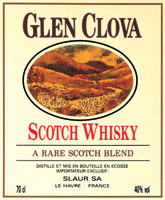 Whether The Glenlivet was the first to use the word ‘glen’ in the name of a whisky, I do not know. Its label does not show any glen, but regarding the fame of this single malt I do believe it is an appropriate name with which to end. Next time, we will conquer a few mountains, or bens, if you prefer!